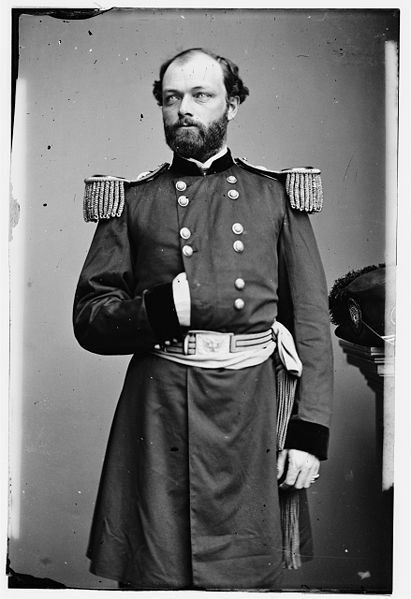 Description:After the July 11 assault on Fort Wagner failed, Gillmore reinforced his beachhead on Morris Island. At dusk July 18, Gillmore launched an attack spearheaded by the 54th Massachusetts Infantry, a black regiment. The unit’s colonel, Robert Gould Shaw, was killed. Members of the brigade scaled the parapet but after brutal hand-to-hand combat were driven out with heavy casualties. The Federals resorted to siege operations to reduce the fort. This was the fourth time in the war that black troops played a crucial combat role, proving to skeptics that they would fight bravely if only given the chance. 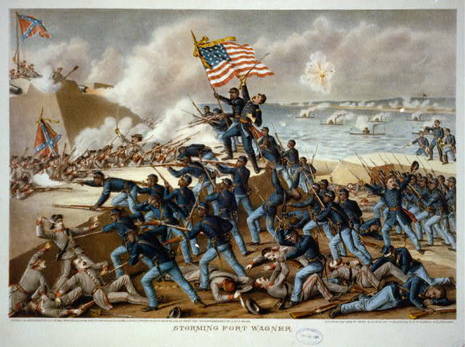 The Second Battle of Fort Wagner, also known as the Battle of Fort Wagner, Morris Island, was fought on July 18, 1863, during the American Civil War. Union Army troops commanded by Brig. 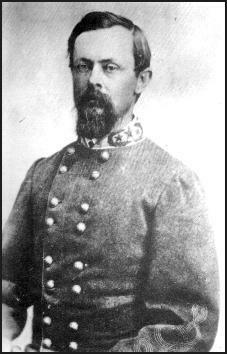 Gen. Quincy Gillmore, launched an assault on the Confederate-held fortress of Fort Wagner, which protected Morris Island, south of Charleston Harbor. The battle came one week after the First Battle of Fort Wagner. The 54th Massachusetts, an infantry regiment composed of African-American soldiers, led the Union attack at dusk on July 18. They were backed up by several other regiments in Gillmore's brigade, consisting of black troops from Louisiana and Florida. Members of the brigade scaled the parapet but after brutal hand-to-hand combat were driven out with heavy casualties. The 54th's colonel, Robert Gould Shaw, was killed. The 54th was hailed for its valor. Their conduct improved the reputation of African Americans as soldiers, leading to greater Union recruitment, which strengthened the Northern states' numerical advantage. The approach to the fort was constricted to a strip of beach 60 yards (55 m) wide. After a bombardment from both land and sea, the Union infantry moved in. The assault force was headed by the 54th Massachusetts and included five other regiments, around 5,000 men in total. Unfortunately for the assault force, the prior bombardment failed to seriously damage the fighting power of the fort and, as a consequence, the Union infantry suffered considerable casualties in the rush to take it. As the Union troops reached the parapets, the fighting proved intense. Three brigades managed to occupy a portion of the walls, but they were forced to withdraw after an hour of fierce hand-to-hand combat where almost every officer was killed. In all, all 1,515 Union soldiers were killed, captured, or wounded. Only 315 men were left from the 54th after the battle. One hundred members of the 54th were reported missing after the battle and were never seen again. Confederate casualties numbered 174. Following the Union repulse, engineers besieged the fort. Confederates abandoned the fort on September 7, 1863, after resisting 60 days of shelling. A depiction of the battle takes place in the film Glory and is the climax of the movie.